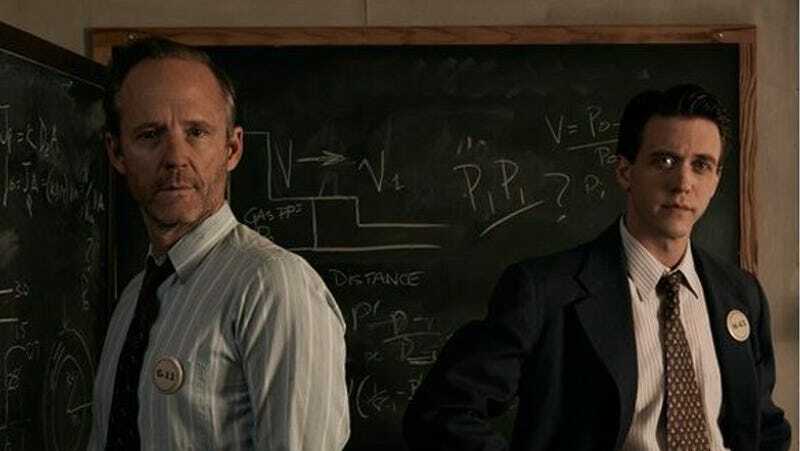 The second episode of the fictionalized account of the Manhattan Project aired Sunday. The situation with one of the physicists working on the bomb reminded me of an episode of Deep Space Nine. Spoilers for Manhattan, DS9 and WW2 ahead. Physicist Frank Winters is obsessed with getting an atomic bomb built to end the war as soon as possible. He's so obsessed that he is keeping a running count in his head of U.S. casualties (which isn't as fun of a party trick as you might think). Because he believes his team's design has the best chance of producing a working bomb first, he made a questionable moral decision in the first episode to keep his team together. Now he's realizing what the consequences are to the fellow scientist he sacrificed. While I'm starting to get into the characters (I'm still not sure where they're going with the wives), the bomb story is not as compelling if you know about the real Manhattan Project. While the characters are fictitious the two bomb designs were real. Winter's implosion design would end up being used for the Trinity Test and the Fat Man dropped on Nagasaki. The Thin Man had design problems (like concerns of spontaneous fission of the plutonium) and would be scrapped in 1944. However, Thin Man's gun type design would be used for the Little Boy bomb dropped on Hiroshima using enriched uranium instead of plutonium.